According to a 2016 mobile messaging report from Ubisend, 51% of people say businesses need to be available 24/7 to answer queries and respond to customers' needs. What’s the most efficient way to achieve this “always on” customer service? Chatbots. Chatbots are software programs that use messaging as a communication interface. Enabled via rules-based programming or artificial intelligence, these systems can help consumers carry out critical or time-sensitive tasks, like scheduling service appointments, troubleshooting technological problems, or getting the answers they need to make more informed purchases. Unlike the customer service assistants that businesses have been placing on their websites for years, newer, more sophisticated chatbot technologies can live in any major chat product, such as Facebook Messenger, Slack, or Telegram, making it easy to integrate them into your brand's social media marketing campaigns. This means users can see an ad you've placed on social media, initiate a chat to learn more, then make a purchase–all without having to leave the app to visit a separate site. Not only does this keep your audience engaged, instead of interrupting them, it's also the way today's consumers are looking to communicate with companies. In fact, the report also found that 45.8% of consumers would rather contact a business through messaging than email, and 49.4% prefer messaging over phone calls. Functioning On Rules: rules-based communications are relatively easy to configure, but they can only respond to specific commands that they are programmed to address, which means their applications are limited. Machine-Learning Based: while artificial intelligence-based chatbots can require specialized expertise to build, the results are significantly more robust and flexible: These systems understand language, not just commands, so they get smarter and more successful at addressing consumers' needs as they learn from the conversations they facilitate. Both methods can help your business efficiently address the needs of prospects and consumers. And, when incorporated into your marketing automation solution, chatbots can also be an efficient way to gather the information you need to acquire, vet, and qualify new leads–without adding stress on your sales and customer service resources. Ideal for mobile interface: users can interact with chatbots without needing to download additional apps or software, making them easier to use while on-the-go. Instant gratification: consumers can get assistance immediately, without having to wait for a customer service rep to pick up the phone or respond via email. 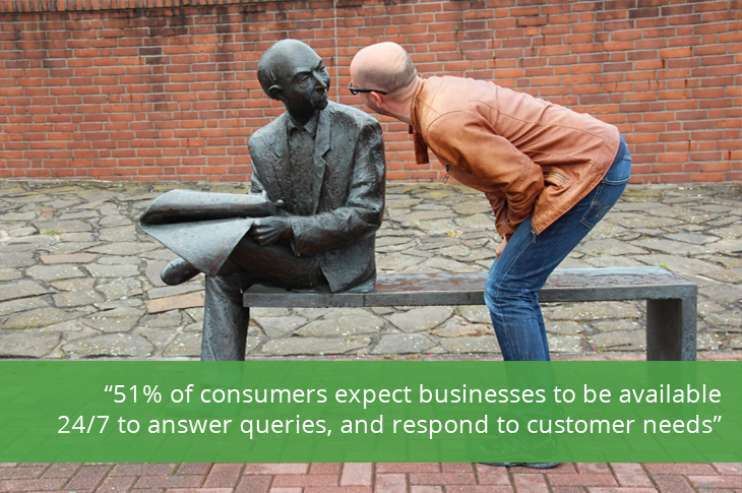 Tailored experience & personalized responses: consumers can ask questions in natural language and receive customized responses based on their particular needs and context. Reflect your brand’s personality: marketers can configure chatbots to deliver information in a way that feels like a natural–even entertaining–conversation, instead of a scripted and impersonal response. Automatic opt-in: by initiating a chat, users are giving their permission to receive information they actually want, instead of being spammed with promotional messages. There are several self-serve solutions available to help your business offer basic chatbot capabilities; however, if you’re looking to create a high-quality experience that will positively impact your new lead and customer acquisition goals, we’d like to work with you. We have designed and developed chatbot solutions for many of our clients, with cost-efficient and scalable methodologies that can provide an optimal user experience while delivering tangible marketing results for your business. Are you looking to refine and grow your new lead and customer acquisition efforts? Let’s talk.